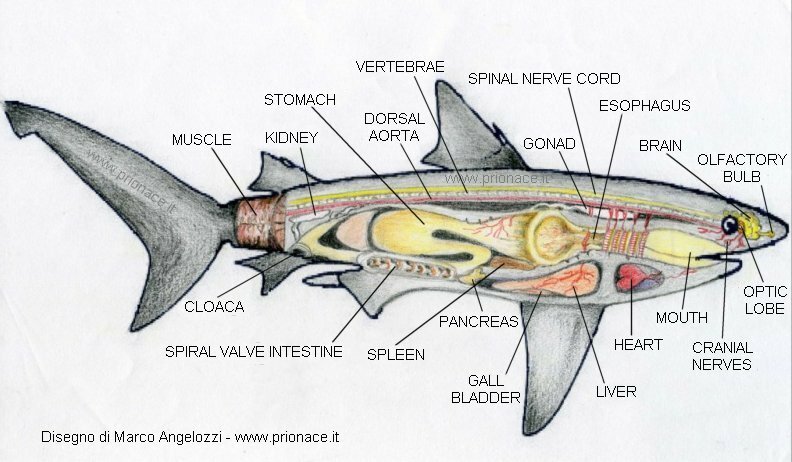 In this page you can see SHARK ANATOMY. To see the external morphology press here. In the shark mouth there is the tongue, while there are no salivary glands. The esophagus is enough wide but brief and finishes with the stomach. It is wide, and generally has the form of U. The intestine, simple and straight, has some reliefs of the inside wall, (spiral valve, of various forms) that increase the absorbent surface. The refusal substances go out to the outside through the cloaca, that is a common opening for the urinary, digestive and reproductive system. The liver is very great and it can reach the 25% of the weight of the shark. This organ has the function of energetic backup, and the function od idrostatic organ. Sharks in fact don't possess the swimming bladder (an inside afloat organ that can fill it with gas, present in the bony fishes, whose function is above hidrostatic) and it is the great liver, constituted to a large extent of oils, above all squalene, lighter of the water, to decrease the density of the body and to increase the buoyancy. The heart is found in ventral position, next to the gills and it is of enough redoubts dimension. The circulatory system is closed and besides the heart there is an arterial system, that brings blood rich in oxygen to all the organs (through the dorsal aorta), and a venous system, that brings the blood rich in carbonic anhydride and organic cinders to be purified and again oxygenated in proximity of the gills.